Killiam and Bassette Farmstead‘s stand at the Farmers’ Market of Plainville had kohlrabi (which I have seen and heard of but never prepared) so I decided that its about time I try it. The young ladies at the stand were very helpful and of course The Joy of Cooking (a wedding gift from my sister in law that I have used for over 25 years for the basics and not so basic) is a great resource as well as the internet. 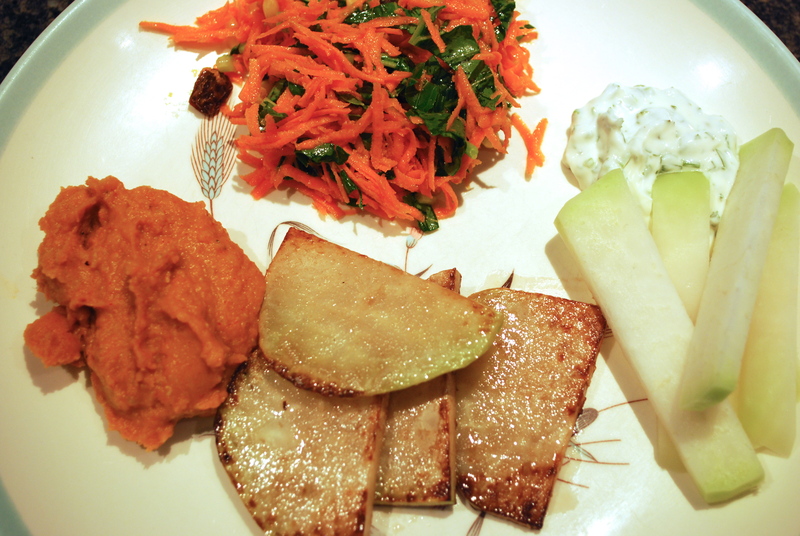 Fried kohlrabi served with homemade smokey red lentil dip (can also be used as a vegan pate), raw kohlrabi sticks served with homemade cilantro and garlic scape yogurt dip and a raw fresh salad made with the kohlrabi leaves. 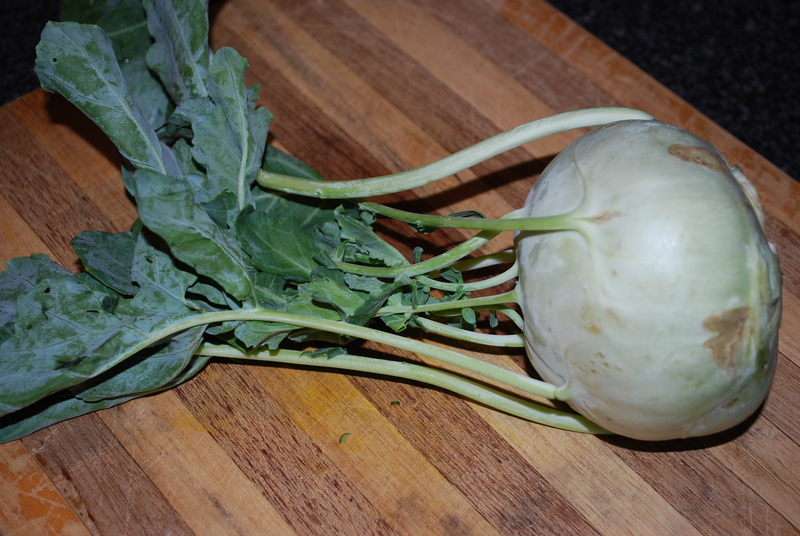 To prepare the kohlrabi– remove and set aside the leaves to make a salad. 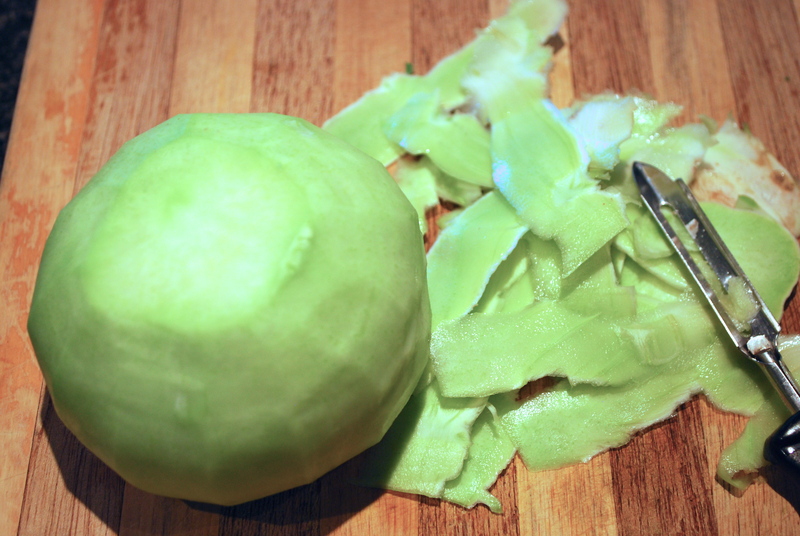 Peel the kohlrabi with a potato peeler and cut it in half. It smells faintly of broccoli which makes sense since they are both cruciferous vegetables (as are kale and cabbage so all healthy food choices). I thought the “ball” was the root but it is actually a thick stem that the leaves grow from. 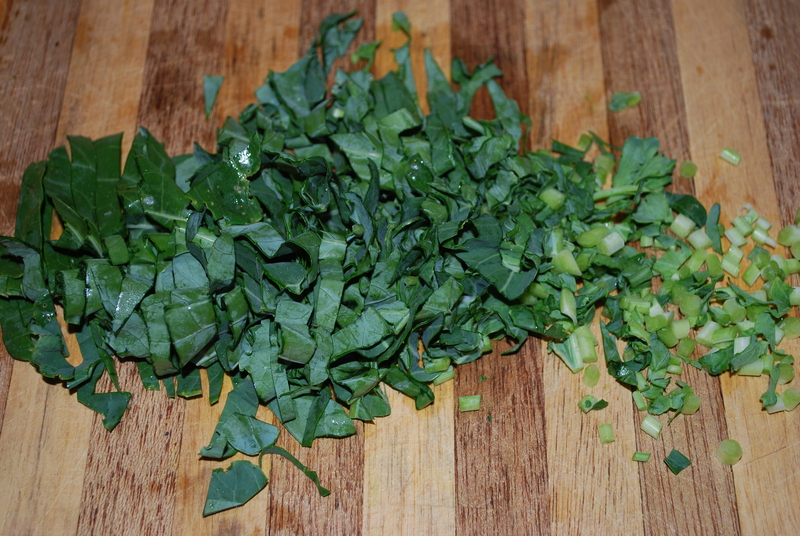 Rinse and cut the leaves into thin strips. 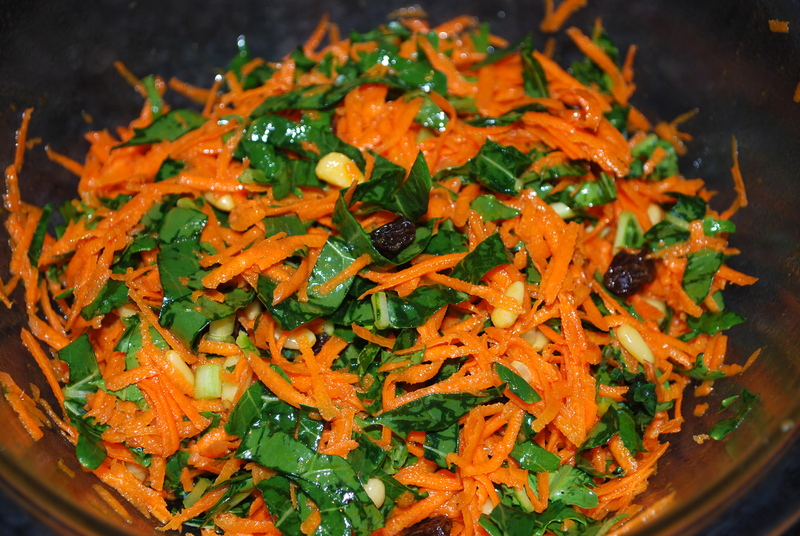 Massaged the leaves and place in a bowl, add 1 shredded carrot, sprinkle with 1/4 cup pine nuts, 1/4 cup raisins, 1/4 teaspoon sea salt, dash ground white pepper, 1 Tablespoon white wine vinegar and 1 Tablespoon extra virgin olive oil, toss and chill till serving. Bring lentils and water to a boil, reduce heat and simmer for 20 minutes until lentils are tender and most of the water is absorbed. Check so it does not burn, add 1 Tablespoon of water at a time as needed during cooking time if water absorbs too quickly. In the meantime, sauté vegetables and salt in extra virgin olive oil in a medium sized frying pan with a lid. Start with the olive oil and onions at medium heat, add the celery, carrots and salt, stir, reduce heat to low and cover cooking for 20 minutes. 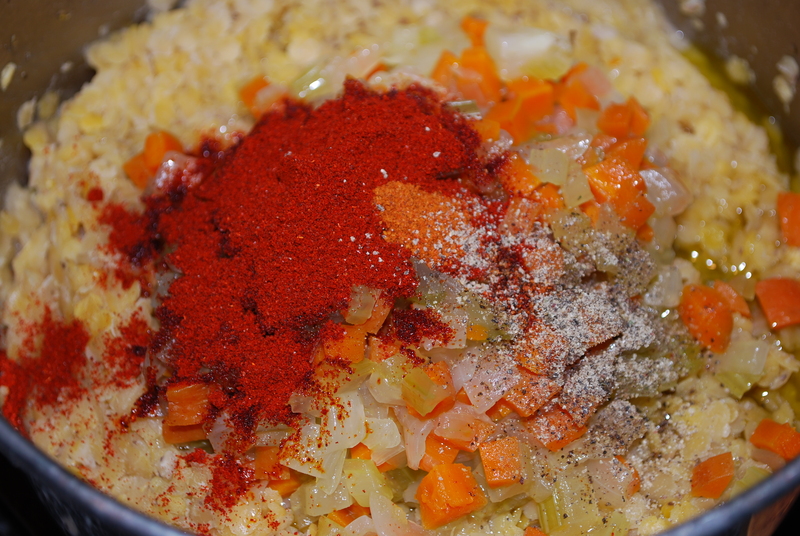 Add the sautéed vegetables, paprika, cayenne and black pepper to the lentils and blend until smooth. I used a hand held (stainless steel) blender but a food processor or counter top blender will work just fine. Chill until ready to serve (can be made the morning of or the day before). 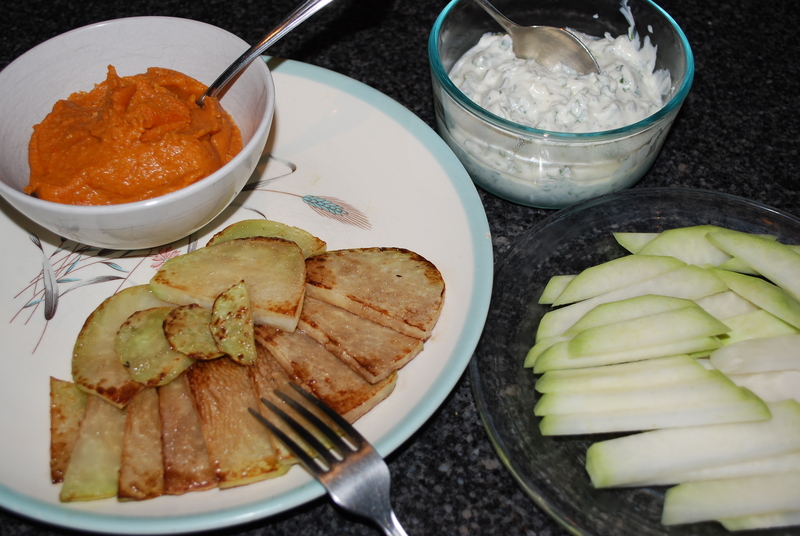 Serve with kohlrabi sticks, other vegetables for dipping and crackers/bread/gluten free version etc. 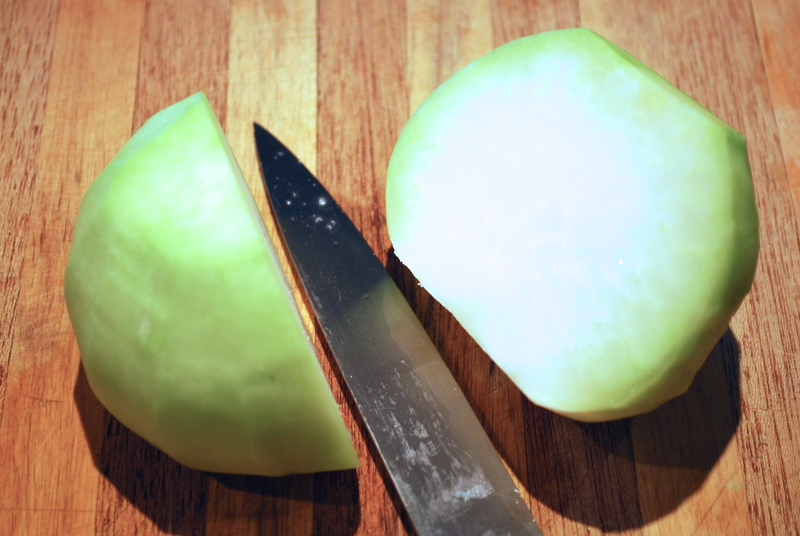 To prepare fried kohlrabi– peel and cut kohlrabi into half-moons about 1/8″ thick. Heat a heavy bottomed (I use cast iron) skillet over medium high heat and coat the pan with butter/olive oil/canola oil. Add prepared kohlrabi and cook till golden. Flip and cook till golden on second side. 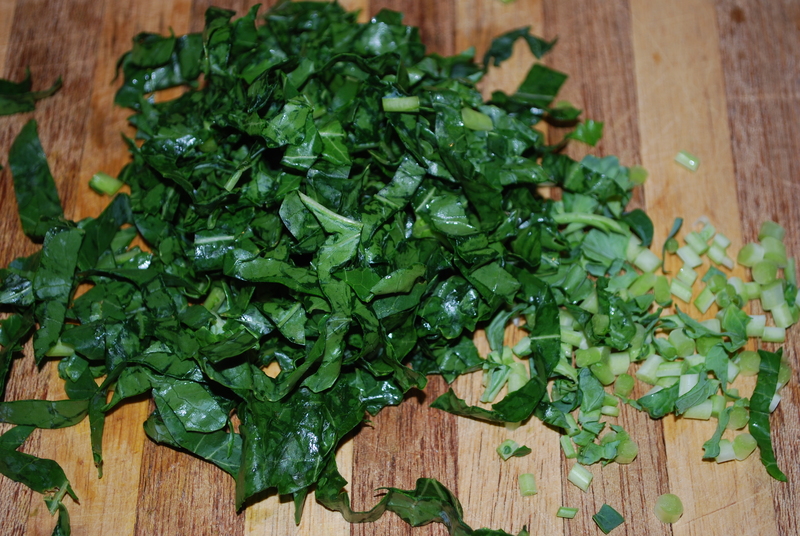 Remove from pan, place on a plate/platter and continue until all pieces are fried. 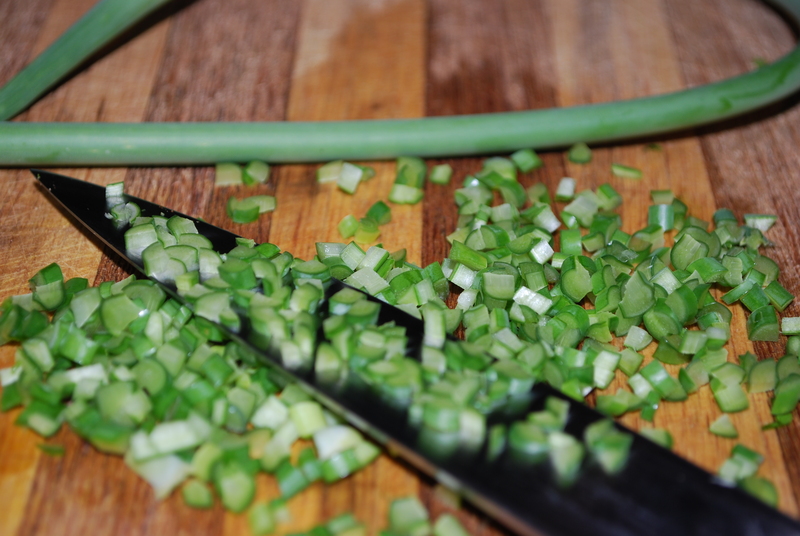 Peel and cut kohlrabi into (1/8″x1/2″) sticks for dipping. 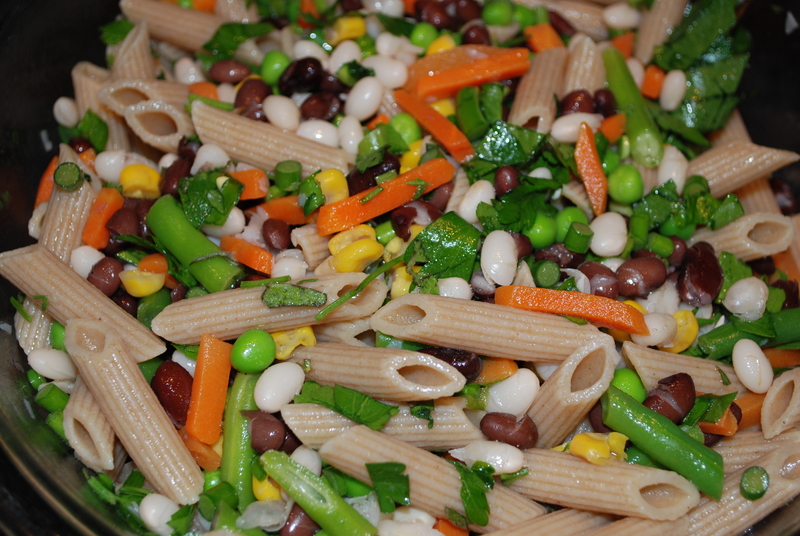 Mix all ingredients together and chill until serving. This can be made the morning of or the day before. 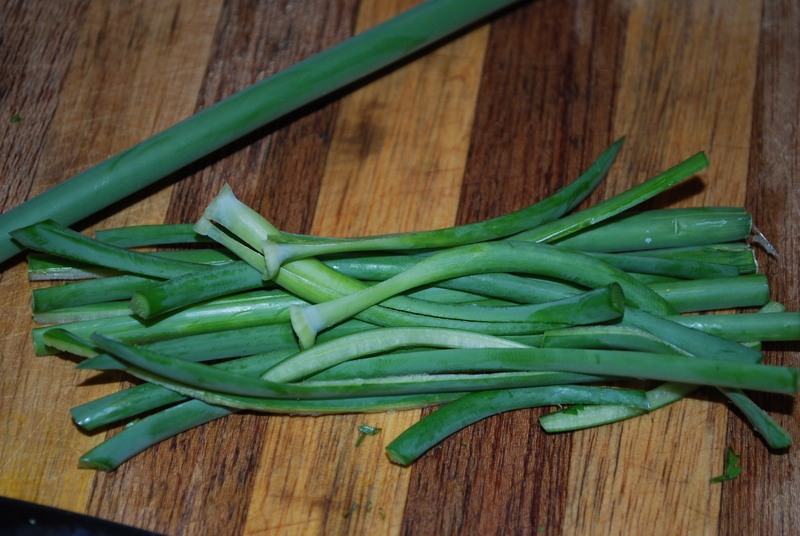 Cut the scape(s) into roughly 4 inch sections so it is easier to cut them into quarters (in half then half again) lengthwise. Line them up as closely as possible then starting at one end finely cut off sections. 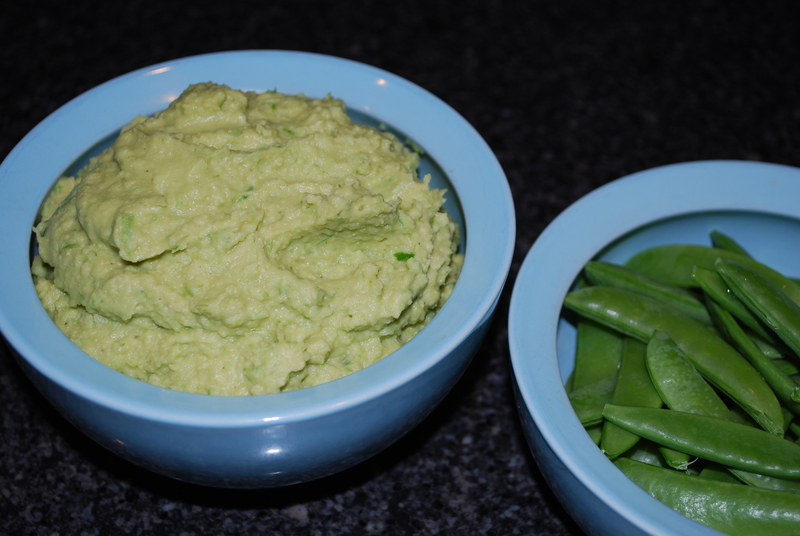 This entry was posted in in the kitchen and tagged cruciferous, dip, fresh, fried, garlic, gluten free, healthy, homemade, kohlrabi, lentil, pate, raw, recipe, red, scape, scapes, vegan, vegetarian, yogurt on June 29, 2014 by lenapietri. 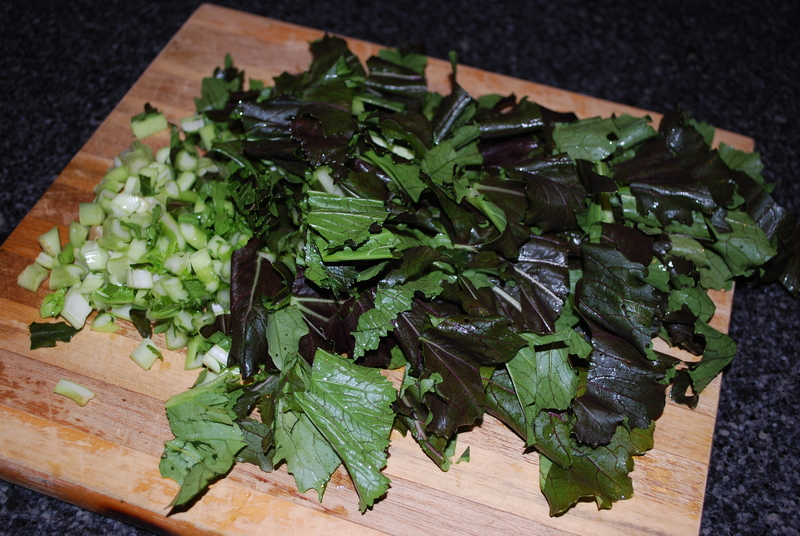 At the Farmers’ Market of Plainville I purchased Asian Greens from Dinebergs Farm. 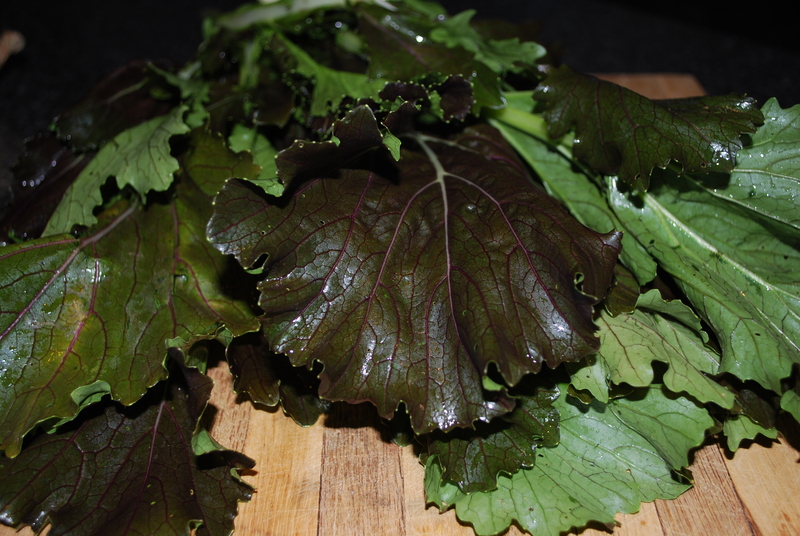 When I looked up “Asian Greens” on line I found many varieties of greens but after some digging I believe I purchased Purple Mizuna. 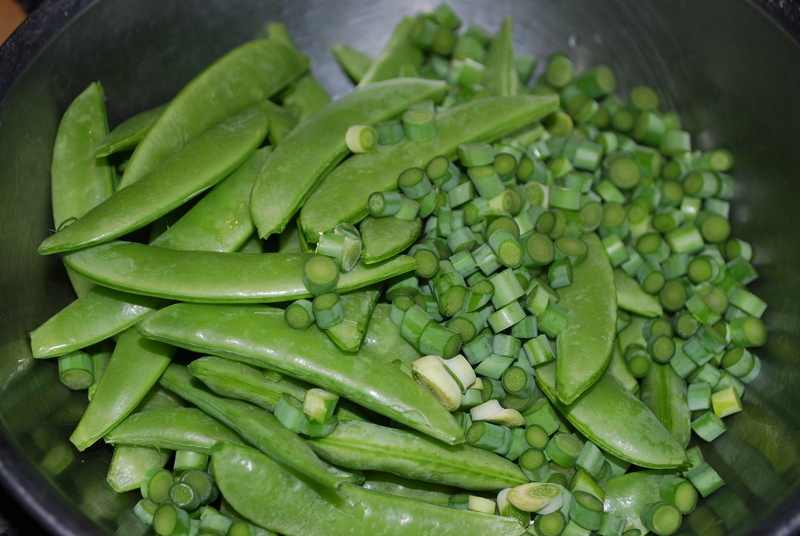 I picked the only items that were ready out of my garden; garlic scapes and snap peas which is how this recipe came to be. Cooking locally and seasonally is wonderful, everything is fresh and, in my mind, “as it should be” if we are trying to live as close to nature as possible. In the meantime mix together the oils, soy sauce, water and spices for the sauce in a small bowl. Preheat a large heavy bottomed pan (I use a cast iron skillet that has a lid) over medium high heat. Prepare the vegetables, pour 1 Tablespoon canola oil into the hot pan, add the onions and stir occasionally so they do not burn, sautéing for 2 minutes. 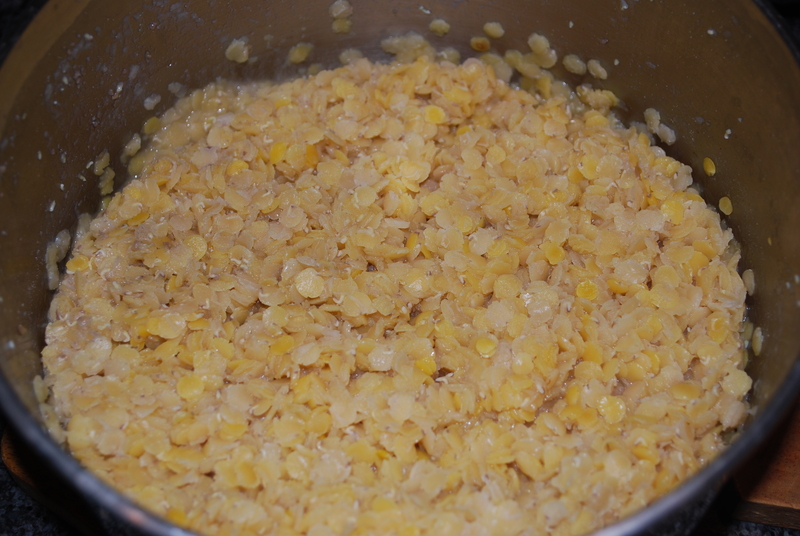 Add the remaining ingredients, stir, pour the sauce over top, reduce heat to medium and cover. Saute and stir occasionally for 2 minutes or until the greens (which are also purple) have wilted. 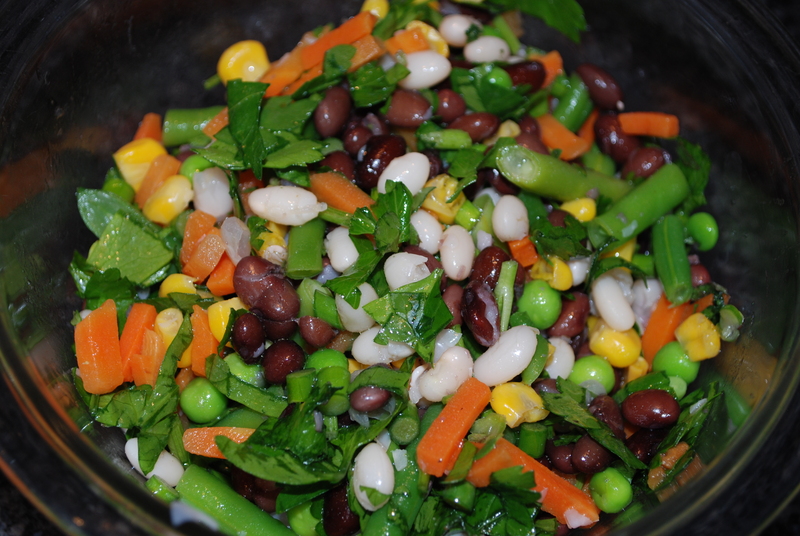 This entry was posted in in the garden, in the kitchen and tagged Asian, brown, farmers, garden, garlic, greens, local, market, mizuna, peas, plainville, purple, rice, saute, sauted, scapes, seasonal, snap, sugar, vegan, vegetarian on June 28, 2014 by lenapietri. Heat a wide bottom 3-4 quart pan over medium heat. Add olive oil, onion and salt; cover and allow to simmer 3 minutes. 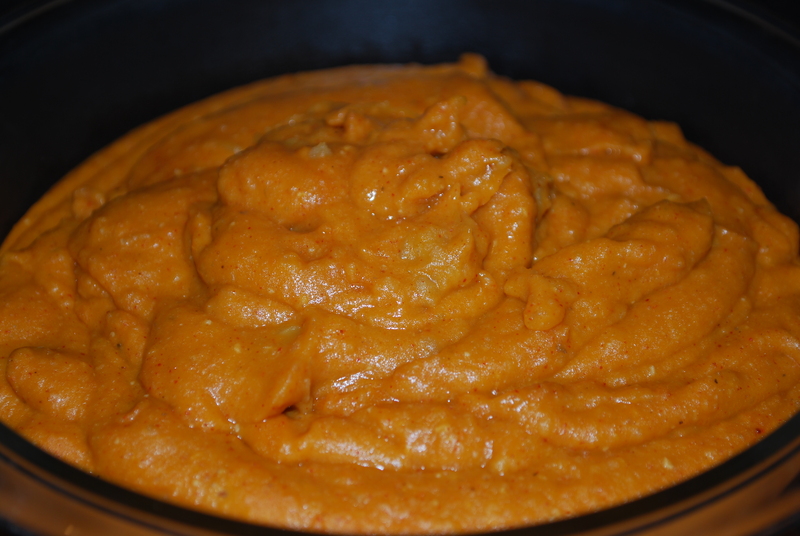 Add celery and carrots, stir, cover and continue to simmer 5 more minutes. Add potatoes, spices and water, cover, bring to a boil, reduce heat to simmer and cook for 20 minutes. Add scallops, bring to a boil, reduce heat to simmer 5 minutes, turn off heat and leave covered until ready to serve. 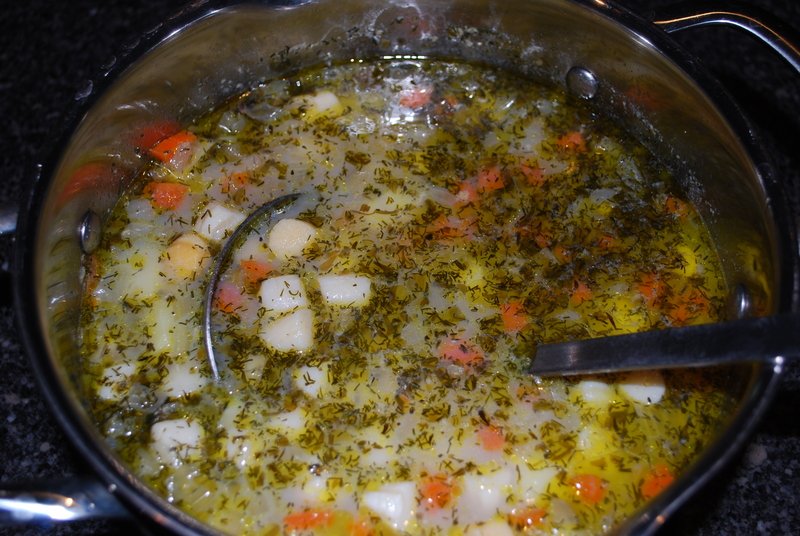 This entry was posted in in the kitchen and tagged bay, chowder, dairy free, dill, herbs, recipe, scallops, soup, tarragon, thyme, weed on June 24, 2014 by lenapietri. 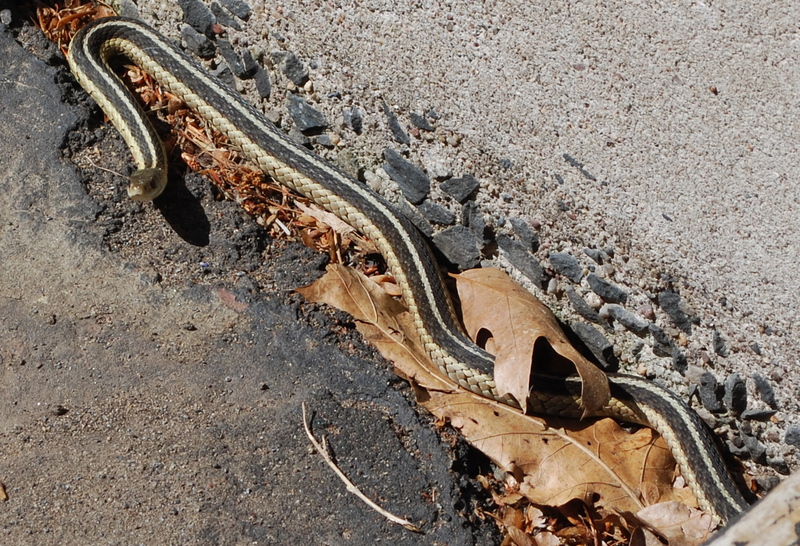 In the corner by the front steps where the sun is nice and warm early in the morning a common garter snake was sunning itself. I think we both startled each other! The evenings have been unusually cold so this one found the best spot to warm up. This entry was posted in in the garden and tagged common, connecticut, ct, garter, plainville, snake on June 24, 2014 by lenapietri. 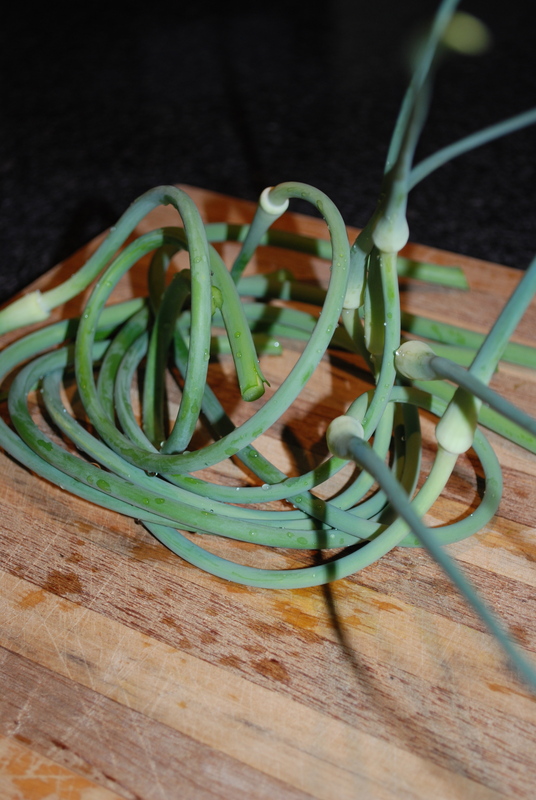 Today I picked a handful of garlic scapes in the garden. They are “cool” the way they twist and curl. 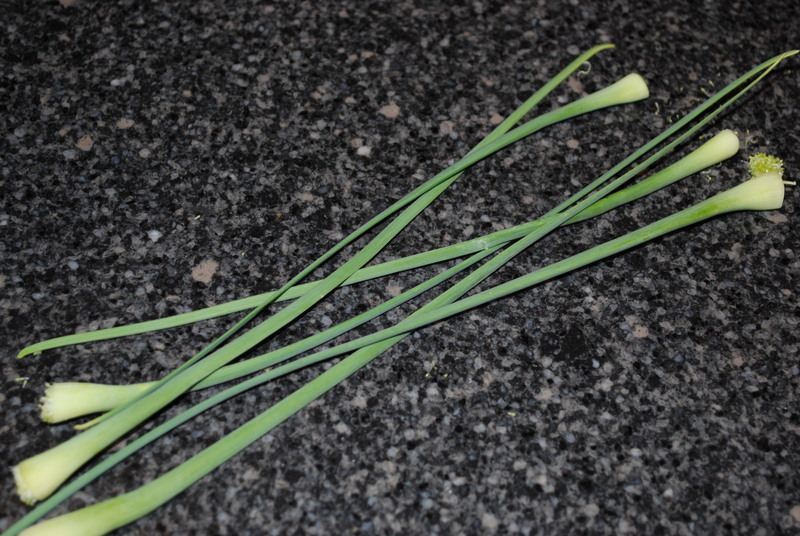 The mild garlic flavor is a preview to the tangy bulbs still growing. 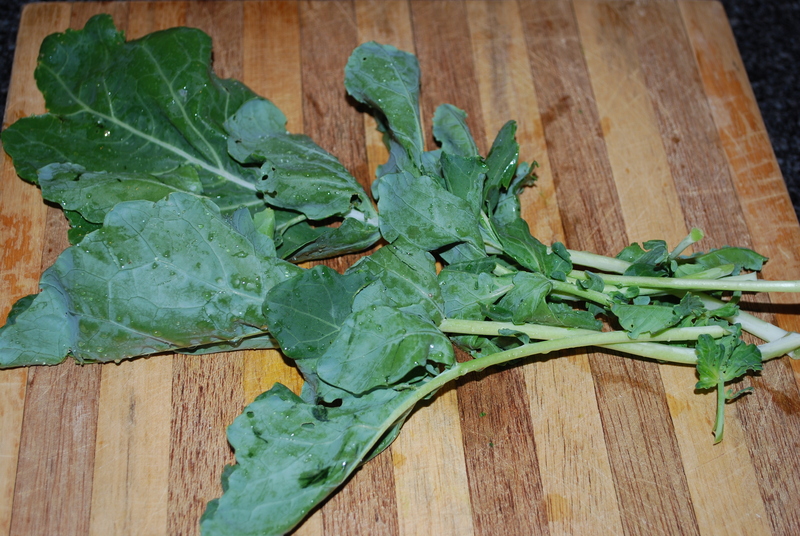 The buds and the tips are a bit tough/fibrous so they were composted but the stems are crunchy when fresh. I will also be sautéing them for another meal making them tender and making pesto to freeze since garlic scapes are a short season. 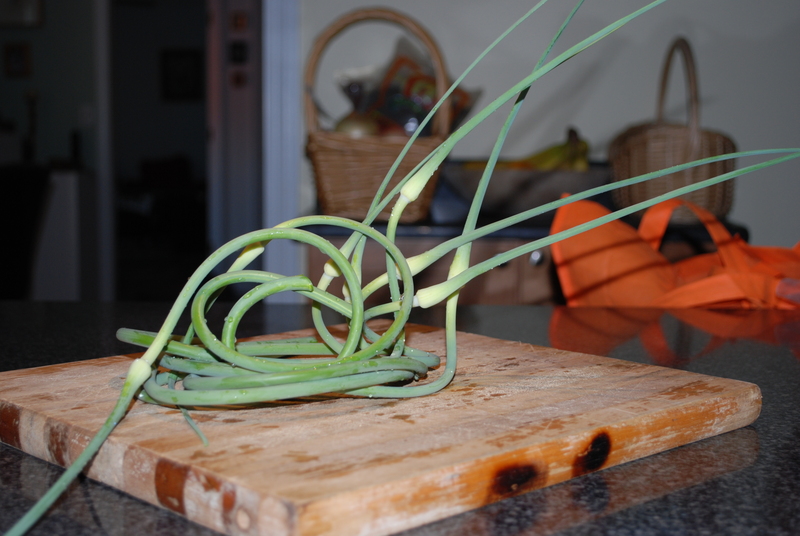 This entry was posted in in the garden, in the kitchen and tagged garlic, scapes on June 24, 2014 by lenapietri.